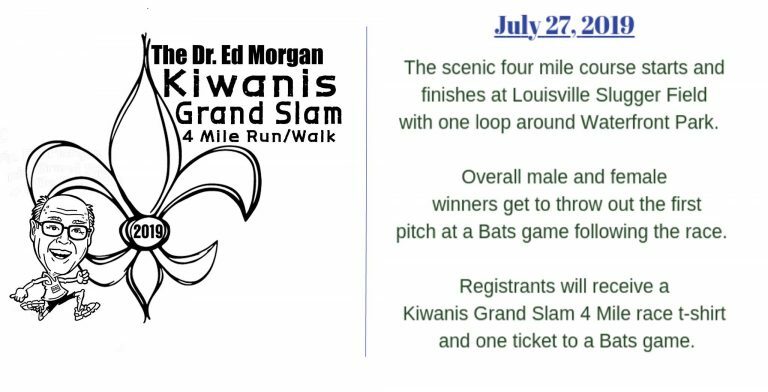 Join us for the Dr. Ed Morgan 4 Mile Kiwanis Grand Slam Run/Walk for the benefit of Heuser Hearing & Language Academy and Big Brothers Big Sisters! All registrants will receive a high quality Grand Slam 4 Mile race t-shirt (only pre-registered will be guaranteed a shirt on race day) and one ticket to the Bats game at 6:30 p.m. Saturday, July 27th against the Scranton Rail Riders on a Louisville Mashers Weekend. It’s back this year! The famous BACON and Pancake Breakfast following the race inside Slugger Field. Chow down on pancakes while waiting to see if your name is drawn for a door prize and applaud the overall winners and age group winners during the Awards Ceremony. Please note, age group awards will only be available race day at the awards ceremony so plan on sticking around! Participants may purchase additional tickets for just $5.00. Walk-in and late registration available at Fleet Feet Sports, 117 Breckenridge Ln. Suite 8 (St. Matthews Station) (502)479-URUN from 10:00 a.m. until 7:00 p.m., Friday, July 26th. $25 early registration, $30 after June 30th and $35 race day. The race is named in honor of Dr. Edgar Morgan. Dr. Morgan was a dedicated Kiwanis member and long-time advocate for the Louisville running community.